JR Farm – LEOTSAKOS I.K.E. The JR FARM once was an agricultural enterprise in Bavaria with an arable land of approx. 50ha and 40 dairy cows. Out of love for animal dogs, cats, rabbits, guinea pigs, hamsters, geese and goats were also kept on the farmstead. By being exposed to the animals on a daily base, the present Managing Director, Herta Ruisinger, increasingly paid attention to their feeding habits. She discovered that many products available in the past did not meet with natural nutrition and therefore needed to be optimised. This motivated the couple Jakob and Herta Ruisinger to found the company JR FARM about 20 years ago in order to produce species-appropriated petfood. JR is the initials of the Managing Director Jakob Ruisinger. „Being noticed, to inspire and convince“ by visual and meaningful impulses during the production of high grade pet food was and still is the device of JR FARM. The marketing of products kept naturally went excellent and the demand increased continuously, soon letting the agricultural facilities become turn too small. A facility in the commercial area of Pessenburgheim came to existence. In order to meet the increasing demand of JR FARM products and the diversifying product range, JR FARM had to expand their facilities in 2005. To assure a consistent quality, JR FARM was certified according to ISO 9001:2000 and HACCP for the first time in 2006, even though it is not required by law. The compliance with the hygienic legal requirements and with the DIN EN ISO 9001:2000 requirements has been constantly controlled. The issued quality management and HACCP manual describe the quality management system and the legally controlled treatment of petfood. Since then the company will be audited every year. In 2007 JR FARM obtained its Organic Certificate, serving as impulse for the production of a new product range. Thereby JR Farm was able to present the new organic product line under the name “Bio-Line” at the Interzoo 2008. In 2008 by a bakery has been completed. A new production line for rodents, birds cookies as well as baked sticks has been established and since then was extended over and over. To continue to guarantee an immediate delivery, a second warehouse has been built in 2010. JR FARM clients are no longer found in Europe only. The distribution of its healthy, species-appropriated food is already successful world wide. Today more than 200 people are employed and the premises cover about 6,000 square meters. The about 50 ha of arable land is still being farmed and the entire crop flows into the production. Many specialised crops such as stinging nettle, peppermint, balm and many other healthy plants are cultivated. This enables JR Farm to produce low cost yet high grade feed which is packed freshly harvested without long taking transportation. This conserves the environment and helps to avoid unnecessary CO2 emissions. JR FARM still provides a lovely home for their animals. The big open-air enclosure accommodates dwarf rabbits, guinea pigs, mice, chinchillas, degus, mini pigs, horses, chicken and all sorts of birds. Furthermore 5 cats and two dogs also belong to the family. In 2008 Stefan Ruisinger, one of the three sons of Herta and Jakob Ruisinger, entered as third Managing Director. He contributes already since his adolescence to the success of the business. The company stands for „natural well-being with natural nutrients“! 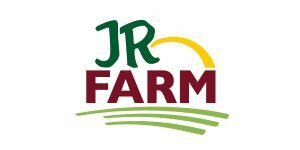 JR Farm is additionally supported by biologists and veterinarians to assure that the ingredient mixes are on highest level concerning nutritional physiology. Leotsakos I.K.E. is JR Farm ‘s exclusive representative in greek & cyprus market since 2017.